Thermometer: Precise results from 0.1-80.0∞C (32.0 -176.0∞F). ✅ QUICK AND EASY TO USE - Measure your water quality within seconds. Simply dip the meter into the water, gently stir, and lock the results on the screen. Our easy to follow instructions make this factory calibrated TDS meter super convenient to use, whether at home or on the go. ✅ UP TO 20% BETTER ACCURACY: The advanced 3-in-1 smartpen combines TDS, EC, and a temperature meter for improved accuracy. With an Automatic Temperature Compensation and the measuring range of 0-9999 ppm +/- 2%, it is an extremely handy device to have around. ✅ FREE TDS E-BOOK: As a special thank you, we will send you a free "TDS Testing Guide" (PDF) including useful tips and insights from qualified water experts. This will help you navigate the world of TDS testing with an ease. 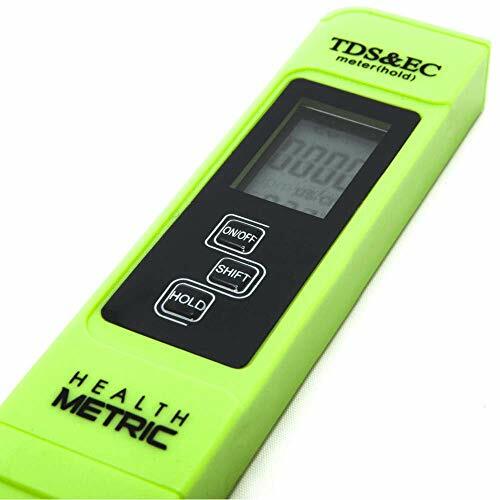 ✅ EXCELLENT VALUE - Our TDS meter provides a cost-effective way to regularly measure the effectiveness of RO/DI systems, water quality in pools and aquariums, hydroponic nutrient balance and much more. The strong Titanium alloy probe keeps it functioning for years to come. ✅ DEDICATED TEAM OF EXPERTS - You can always count on our team of EPA experts, with more than 30 years of expertise in the water quality industry. If you have any questions or problems, simply get in touch with us and we'll help you get it right. If you have any questions about this product by Health Metric, contact us by completing and submitting the form below. If you are looking for a specif part number, please include it with your message.